Blog camp: would you believe? 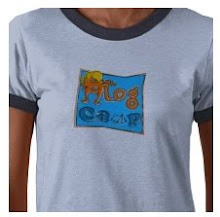 i almost forgot to order myself a blog camp t-shirt. madness. have remedied the situation now. and even got one for husband, since it's all his idea. I got mine a while ago and am waiting for it to be delivered, it's taking ages. I hope it arrives before the camp! oh oh, that's not a good sign! did you order from the UK version of zazzle? i did and i hope that helps! i honestly have no idea how they are, i had just seen zazzle around and knew it was a place you could create such things. :-) i hope they come too! Oh, no, I think I ordered mine from the America site!!!!! Oh, I do hope mine arrives before blog camp!! Mine arrived from US a couple of days ago. However, I seem to have ended up buying children's sizes. Or I'm really fat. Could be either. I think I ordered from the American site as well! It's still a couple of weeks to go so it may still arrive. i already got a shipment notice on mine (which i ordered from the UK site, but which appear to be coming from the US site), so i'm hopeful!